There are some bonds that are unbreakable, like those forged while escaping from a zombie horde. Those last a lifetime. So join in the fun as you and your friends find a way to outlive the undead. Trapped in a room with a zombie works by you having to figure a way out of the room you’re in before the zombie gets to you. The zombie is chained at a corner and every few minutes the length of chain is increased. Can you get out before it gets to you? This is one of the most popular games out there and it’s become one of the best-selling live-action franchises in the world. Get a moment with your friends who might even take a bite out of you with one of the best puzzles for adults there is right now. Forget zombies in chains for a minute. Real escape room games can have you trapped in the house and you have to work your way out. Never will your non-existent leadership skills and quick thinking be more tested than when you have to find a way to solve the puzzle that constitute the whole house. You’d be surprised by how much effort went into making some of the rooms, a Victorian era setting will be complete with a tea set and your dystopian scientific lab will have laser detectors installed. The real room experience can also be set up so you can compete with others. 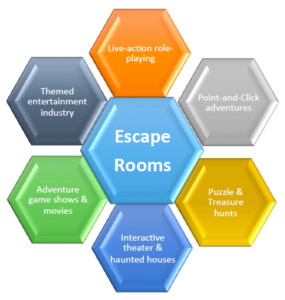 If not interested in those puzzles for adults then a mystery escape game might be better suited for you. With your deerstalker hats on start poking around who poisoned the bartender in the room and solve it in time. The police will be behind that door when it opens and if you don’t have answers you are going away for a long time because you all had motive. Mystery games are entirely different from the others because it’s more than just a puzzle, you have clues you need to use to solve it. So come on over and bring your family too. You just might impress your father with your skills and he gives you that hug you’ve waited 35 years to get.